Buster Crabbe stars as Buck Rogers in PLANET OUTLAWS (1953), an American soldier suspended in time who wakes up to find himself in the futuristic world of the year 2500. Once settled he realizes that an evil villain, along with his gang of outlaws, has been trying his best to gain total control of the universe and everything in it. Buck Rogers has other plans for these thoughtless henchmen and will do anything in his power to stop them in their tracks. With Buster Crabbe, Constance Moore and Jackie Moran. ROCKY JONES SPACE RANGER (Richard Crane) is a spaceship captain who flies around the solar system with his improbably named navigator “Winky” representing the United Worlds—an interplanetary political entity which has a very strong resemblance to Star Trek’s Federation. In Rocky Jones, Space Ranger: Escape into Space, a criminal known for his racketeering has fled to Earth where Rocky Jones takes him into custody, fooling him into giving Rocky a confession of his crimes. (1954). Plus the Felix the Cat cartoon Astronomeous and commercials and trailers. 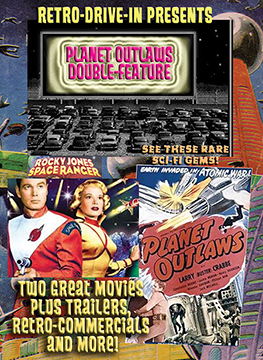 Retro-Drive-In Planet Outlaws Double Feature. 130 Minutes. DVD in Box. Extras.